Whenever you log in to a website using your username and password, you'll be prompted by Firefox whether you'd like Firefox to remember this password. If you click on Remember, the next time you visit the website, it'll automatically enter the username and password for your convenience. Now, back to the topic. Let's say you saved your GMail password in Firefox. After months or years gone by and you don't remember the password you set for my GMail. You started to panic and desperately need to get back your GMail password. Don't worry, here's how you can find the hidden GMail password in Firefox. Firefox is much better than Internet Explorer in terms of managing "remembered" logins. In Internet Explorer, there is no built-in feature where you can manage or view your saved login information. That's why you need third party tools to reveal the passwords hidden under asterisks. As for Firefox, you can access remembered passwords with a few clicks. 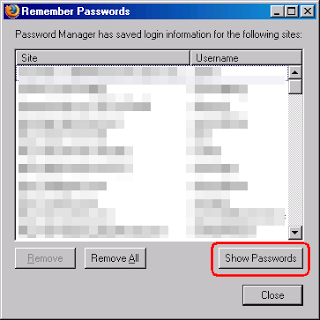 To view your remembered passwords in Firefox browser, go to Tools, and click on Options. Go to Security tab and click on the Show Passwords button. A remember password dialog box will appear. Click on the Show Passwords button again and a new column with password will appear.